When it comes to file transfer over your local area network, Wifi and Bluetooth win hands down, when only “coolness” is considered. 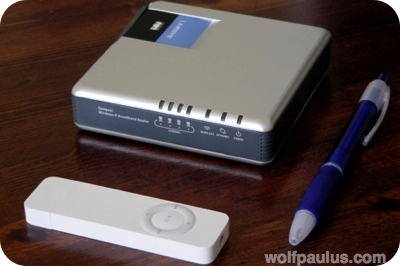 Obviously, the laptops at my house share files using their built-in Airport Extreme cards, but all other computers are connected through a“legacy” 100 Mbit Ethernet Switch (DLink DSS5+) and that is also the case for Tom’s Mac Mini. It would take some serious work to convince him that a plain old CAT5 Ethernet cable really has its advantages, even if it meant not being one of the 802.11 cool kids. We started looking into all the different ways in which we can share (or at least transfer) files between computers. All these networking options have different advantages and their preferred applications. However, we were only looking as one thing: transfer speed, how fast files could be moved between computers. To establish a point of reference, we looked at the time it took to copy 10 megabytes and 100 megabytes locally on the G5 PowerMac. Source and destination location is on the same hard-drive, meaning during a copy-operation, data is sent up and down, effectively doubling the payload. Each test is performed at least 5 times. We take only one result, the best one. We keep on performing the same test, until there is no improvement in three consecutive tests. Only absolutely necessary applications are allowed to run during a test. 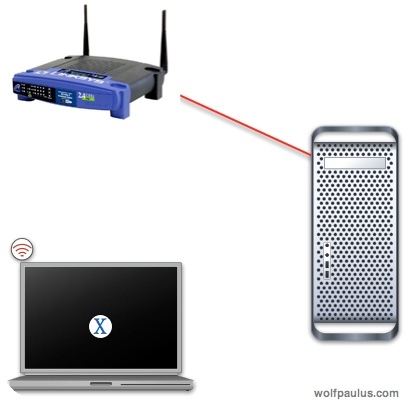 All security features (including WPA, WEP, Radius, etc.) are disabled during all tests. Since we didn’t have any 1000BASE-T enabled switch or router, we connected two computers with a straight-trough CAT5 cable. The Macs are equipped with auto-mdix network interfaces, allowing us to connect two machines directly, without the need for a crossover cable. However, 1000BASE-T requires all four pairs of a CAT-5 cable to be present. 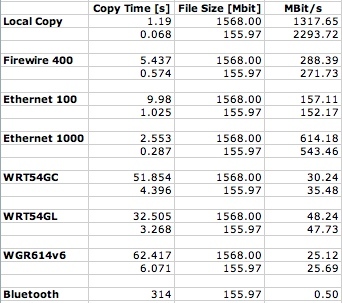 Unsurprisingly, with a measured 614 Mbit/s, Gigabit Ethernet scored the best result in all tests. The 100 MByte test file was copied back and forth in about 2.5 seconds. 100BASE-T Ethernet is what we usually use on the LAN at home, since all switches and router are able to handle this standard. However, to comply with our test rules, we didn’t use any of those and again used a direct cable connection to perform the related set of tests. The result (152 Mbit/s) came in much better than expected, which may be due to the OS buffering some of the transferred data. The 100 MByte test file was copied back and forth in about 10 seconds. 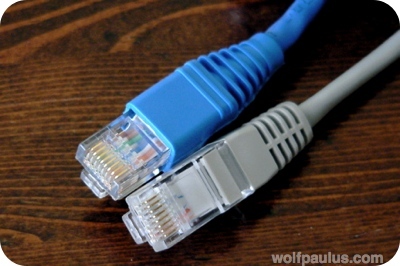 Both test machines were equipped with Firewire 800 and Firewire 400 ports. Unfortunately, we could find a Firewire 800 cable and therefore only Firewire 400 was tested. Setting up a TCP/IP network over Firewire is pretty straightforward. Again, a direct cable connection was chosen and IP addresses were manually assigned. Like we had expected, the Firewire-400 result (288 Mbit/s) was somewhere between Gigabit and Fast Ethernet but a little slower than anticipated. The 100 MByte test file was copied back and forth in about 5.5 seconds. Now that we knew how fast we could copy data locally and over all sorts of wires, it was time to cut the cord and focus on some more fashionable networking options. Among the several wireless routers we used in the test was the new tiny Linksys WRT54GC, a Wireless-G (802.11g at 54Mbps) and Wireless-B (802.11b at 11Mbps) devices with built-in 4-port full-duplex 10/100 Switch, measuring only 3.86″ x 3.86″ x 0.98″ (98 mm x 98 mm x 25 mm) W x H x D.
Unsurprisingly, this conventional and widely used wireless router performed best among the wireless options. 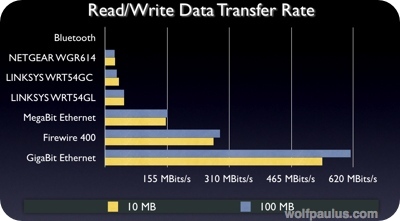 We measured up to 48.23 Mbit/s and the 100 MByte test file was copied back and forth in about 32.5 seconds. Not quite as fast as its big brother but still very much inline with expectations was the transfer speed of this cool little device. We measured up to 35.48 Mbit/s and the 100 MByte test file was copied back and forth in about 50 seconds. The stylish white Netgear router performed surprisingly not inline with our expectations and came in last, with only 25 Mbit/s. The 100 MByte test file was copied back and forth in about 1 minute 2 seconds. Not really fair – still, we couldn’t resist to find out how long it would take us to transfer the files via Bluetooth. However, after performing the tests with the smaller file (10MByte) we concluded that we didn’t really needed to copy the 100 MB. The Bluetooth test showed a transfer rate of about 0.5 Mbit/s and the smaller 10 MByte file was copied back and forth in about 5 minute 14 seconds.